Prepare an ice bath. Bring a saucepan of salted water to a boil. Add the broccoli florets and blanch for 10-15 seconds or until they turn bright green. Remove with a slotted spoon to the ice bath. Cool and drain. Drop the spaghetti into the boiling water and cook until al dente, approximately 5-6 minutes. Drain in a colander and discard cooking water. Using the same saucepan, bring chicken broth, soy sauce (or tamari), curry powder, ginger and garlic to a simmer. Add the carrots and bell pepper and simmer uncovered 8-10 minutes or until vegetables are almost tender. Add all but 2 tablespoons of the scallions, reserving the remainder for garnish. Add rice vinegar and Sriracha hot sauce. Transfer noodles and broccoli to the broth and heat through. Keep warm. Heat oil in a non-stick skillet over medium-high heat. Season grouper fillets with salt and black pepper to taste and place in the pan. Reduce heat to medium and cook 3-4 minutes per side or until fish easily flakes with a fork. 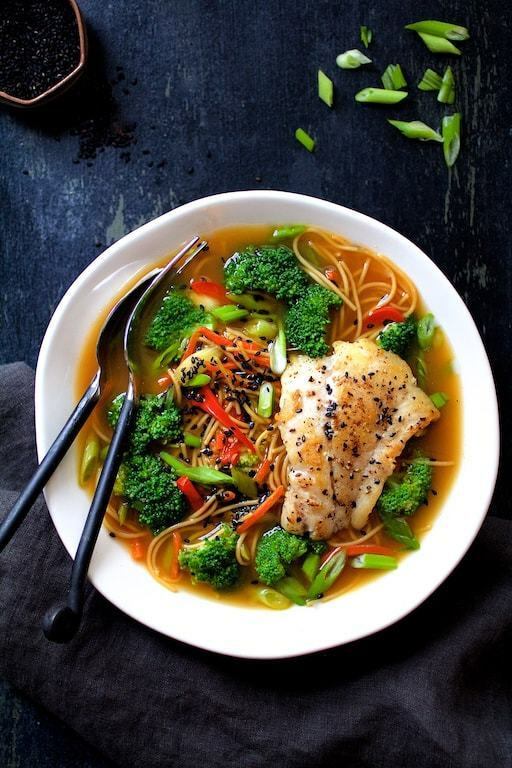 Serve noodles and vegetables in bowls topped with a piece of fish. Garnish with remaining scallion and black sesame seeds.